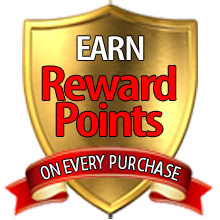 7/8" RNT Red Balls INCLUDED! The Classic Cups and Balls are for the performer who needs the same load capabilities of that of the Paul Fox cups, but is looking for a more common looking cup. 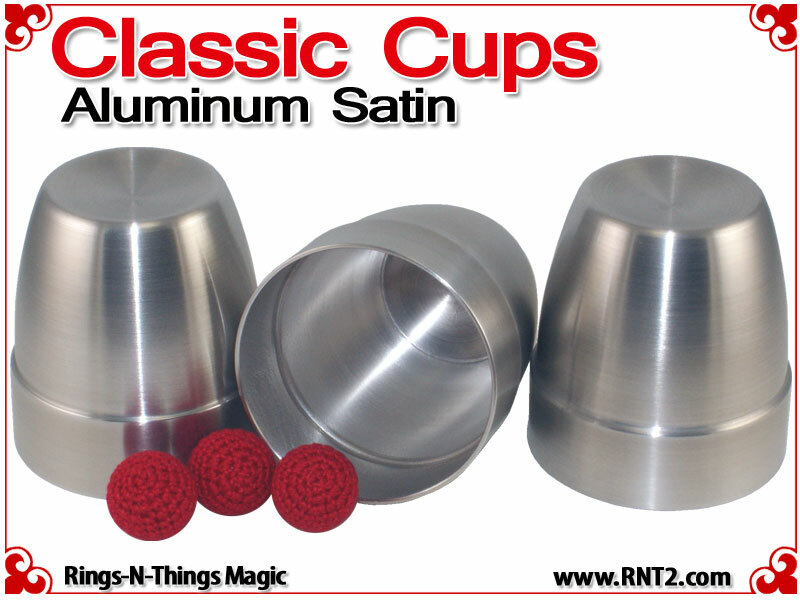 Elegant simple lines, with no center bead, give these cups an innocent appearance, negating any notion that the cups are actually props made for the purpose of a magic performance. 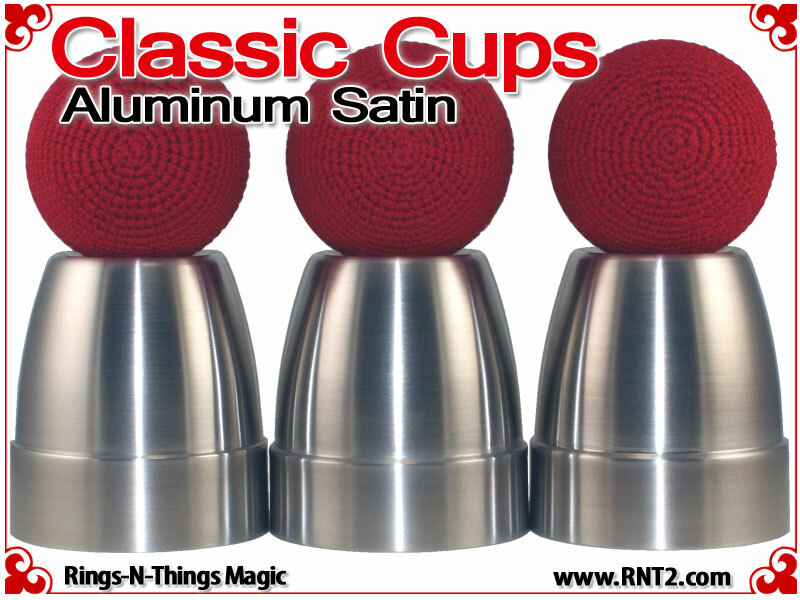 They look like a real cup, nothing fancy or flashy, but are, in reality, a cleverly designed shape and size to provide a performer with a all the tools they need for a magnificent performance of the cups and balls. 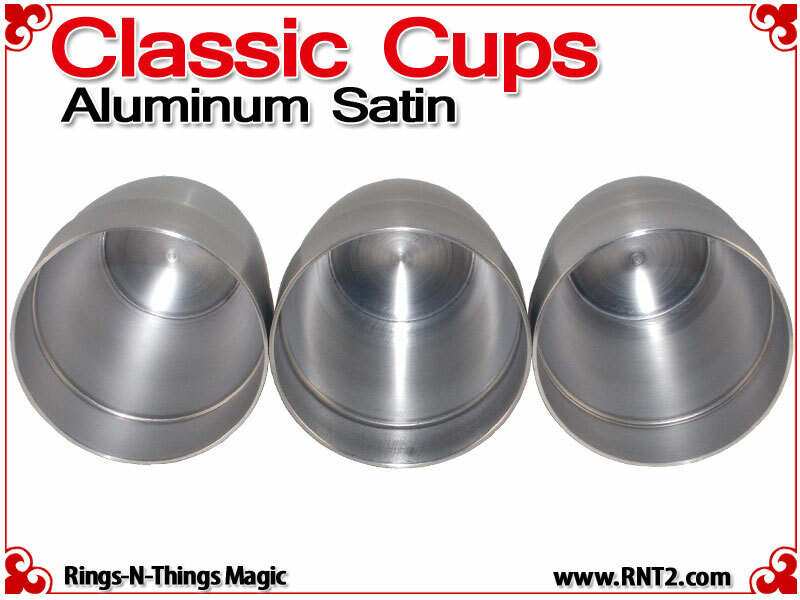 Each cup is hand spun from the original Ring ‘N Things tooling to replicate the original Classic cup design in .050 aluminum with satin finish. The interior is a satin finish. These are elegant, understated cups. They provide nice variety to the more popular Fox style cup variants and are superior to other aluminum cups in this price range. Black balls on a green mat offer a very sophisticated presentation with good lighting. I got these cups initially because of their simplistic look. I love the 19th century style cups and these are a great modernized version of that design. The weight for being aluminum is very good, they are very well balanced and allow for doing classic flourishes (like rolling a cup off of a ball, etc.). The design for the size is perfect because the shoulder height allows for a bit of wiggle room with the final loads. These also make great travel cups for when you just want to practice, or travel light for performances. I have had my set for a few years now and they have taken a beating - there is no denting in my cups but there are light scratches from general use, which just add character in my opinion. Very durable! The RnT Red, Hawaiian Blue, Orange and Parakeet Blue balls all show up nicely against these cups - 7/8", of course. These cups would be great for the beginner who is just getting into Cups and Balls, but also for the professional who wants a durable set that is well balanced, not overly heavy and looks like a plain cup. 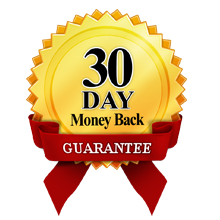 Very fine quality at a great price! Beautiful sheen, silky smooth, and easy and comfortable to handle. 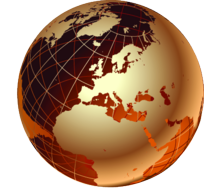 Incredibly sturdy and resilient for aluminum. 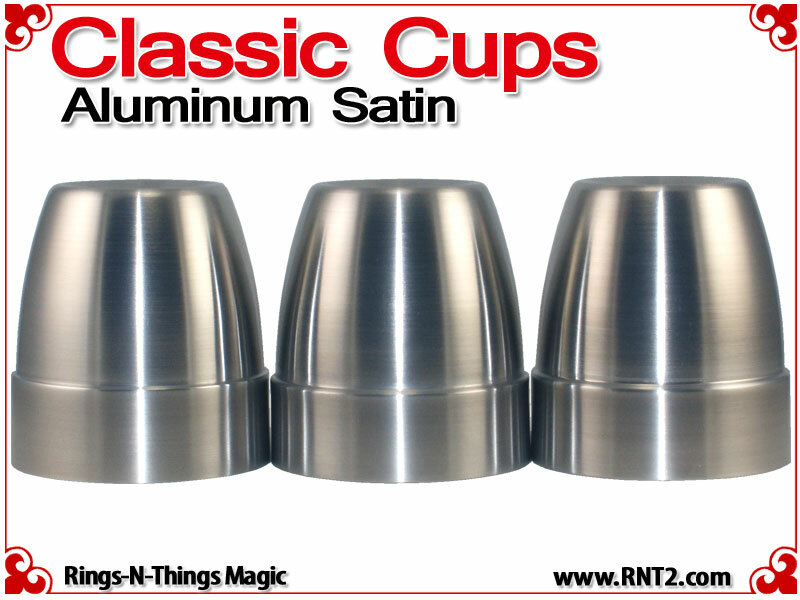 You will not find better quality aluminum cups for such a reasonable price. You will definitely not be disappointed. These cups are excellent and durable. If you travel and want a set to just toss around, these are perfect! 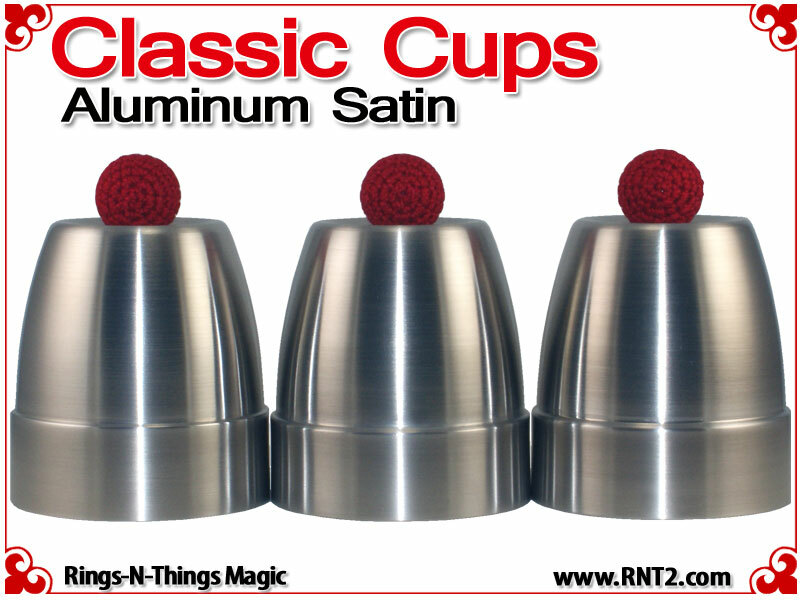 Great saddle and attic space, they stack straight and the weight is really great for aluminum cups. I own two sets and they look great with 7/8" Blue Parakeet balls.